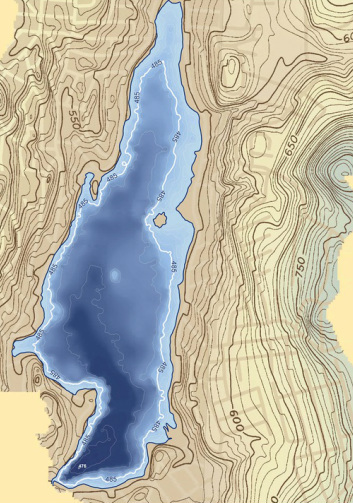 Contour Map of Putnam Lake and Surrounding Watershed Area. The Park District has initiated an independent study of the lake to compliment the results of the CSLAP program and develop a comprehensive lake and watershed management plan for Putnam Lake. This will help improve water quality and provide a balance for recreational and ecological stability. Aquatic Macrophyte Survey: This survey will provide insight into the ecology of the lake, invasive weed and algae species as well as their locations and densities. In-lake Monitoring Survey: This is similar to the CSLAP surveys performed weekly throughout the summer. The independent survey will happen in early Spring, Mid-Summer and early Fall to round out the water quality picture. The Park District is working with Allied Biological for this project. Their staff contains a wide range of scientists and certified lake managers who have worked closely with the NYDEC, NYFOLA and the CSLAP program. In addition they can offer assistance with grant writing, DEC permitting and customized remediation services. Restoration will take time, but with these early steps, we are already taking action to improve our waters.